The 230 examples of the Black Edition are among the most visually distinct of takes to date on the contemporary incarnation of Volkswagen’s feted people movers of the past – apt given that it is launched publicly tomorrow at Manly’s annual Kombi Rally. Also at Manly tomorrow is the Vissla Pro surf tournament featuring 11 time world champion Kelly Slater. Surfing NSW is sponsored by Volkswagen Commercial Vehicles. Based on the seven-seat Multivan Comfortline TDI340, the $63,990 driveaway Black Edition runs a 2.0-litre turbo diesel through the front wheels via a seven-speed DSG, putting out 103kW/340Nm for a combined fuel use figure of 7.7 litres/100km. It rides on suspension lowered 20mm with reinforced anti-roll bar and specific tuning for the suspension and shock absorbers. In a choice of six colours (Cherry Red, Candy White and the $1720 metallics Acapulco Blue, Tumeric Yellow, Reflex Silver and Indium Grey) each features black 18-inch alloys, gloss black roof and B-pillars, exclusive cloth seat upholstery in Titanium Black with contrast-coloured seams, black-trimmed turn signals and the decorative ‘Edition’ film on the side sills and at the rear. Within the distinctive Halifax Maple wood look washable floor, a feature popular in earlier special editions, returns. The highly adjustable seat configuration can be rearranged with the aid of the rail system. The three-seater bench can be folded forward and reclined into a flat-bed. Up front, the driver grips a speed sensitive Servotronic steering wheel and engages with a Premium colour multifunction display. The electric tailgate’s opening height can be stored. Parking sensors detect if there is enough space to open the tailgate. 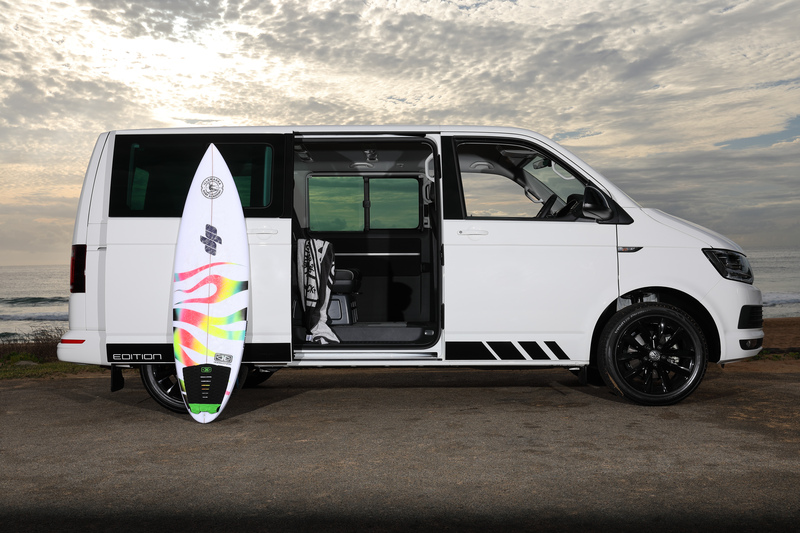 Accessories include: tablet holder for the rear seats; bicycle tailgate carrier capable of carrying four bikes of 60kg combined; a range of luggage compartment trays; roof bars with surfboard carrier; rubber floor mat set; and tow bar kit. All new Volkswagens come with a five year/unlimited kilometre warranty and the option of service packages.